I don’t care about your landing page. 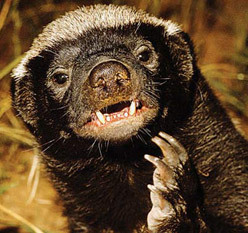 Editor: Honey Badgers want honey so badly that they’ll do anything to get it (including getting stung by 1,000 Africanized bees). So if you can make a page that persuasive, you’re winning. Unfortunately not all of them do. With that, I’ll hand you over to James Gardner (no relation), who’ll walk you through 15 pages, an overview of their customers and what’s good and bad about them, some might get a little bloody, but there’s gold in there too, he makes a lot of sense and has some great advice, so pay attention. If there’s one thing a business wants from its landing pages, it’s conversions. 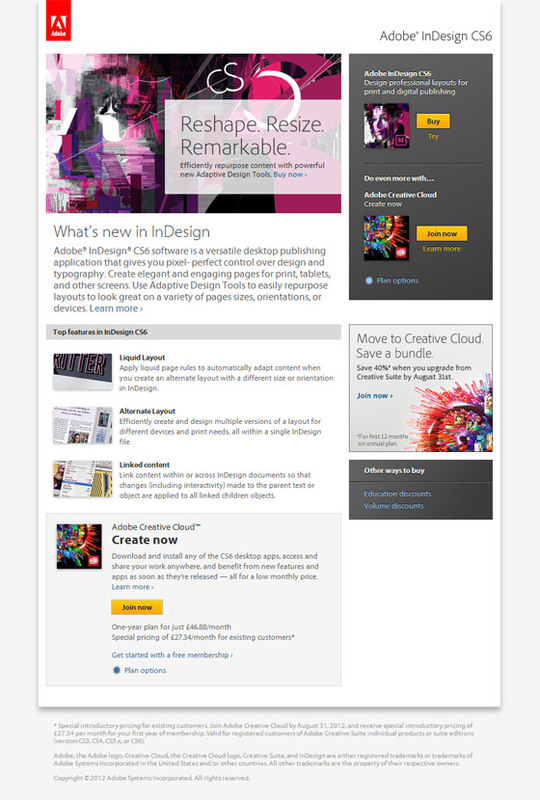 Adobe are well known for their Creative Suite products, of which Indesign is a core part. As a company they’re well practiced in the art of creating landing pages and this is a good example. It’s a simple two-column layout, with the left-hand column giving information on the product and the right-hand column concentrating on conversion. The CTA (Call To Action) panel is visually dominant and the high visibility buttons make it easy to see what is going on. They’ve also used a hierarchical structure within the CTA column, starting with a simple ‘Try or Buy’ for the product, followed by a an upsell to the ‘Creative Cloud’ and then the kicker, an invitation to upgrade from your existing product. They’ve also repeated the CTA at the bottom of the left-hand information column as well; capturing those who are concentrating on the information available on the page. All in all, it makes for an effective and compelling reason to click through and convert. UverVu is a social media monitoring and management tool, available as a cloud-based service. 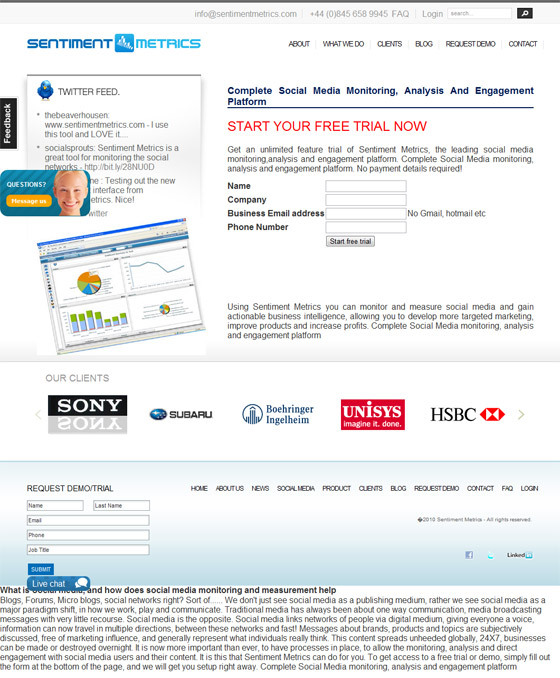 They brand themselves as ‘The world’s leading provider of real-time social marketing intelligence’. Their primary customers are businesses, and in a competitive market, their landing page conversion needs to be spot-on. They do a good job. It’s all about simplicity with this landing page – giving you just the who (the name and strapline), the what (an overview video), the why (a set of logos for their other customers) and finally the CTA. Even the form is kept simple, with just five fields required to get you up and running on your free trial. A nice touch here; the CTA box heading makes it clear what you are signing up for, and the button reinforces the same message. It’s not ‘submit’ or ‘go’, it’s ‘Try it free’. It would be even better if it said “Start Your Free Trial”. This helps to push any last minute doubts away as the user clicks to convert. 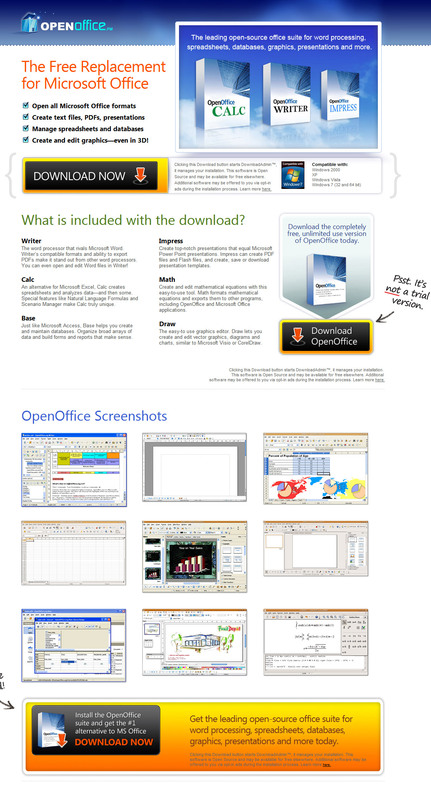 OpenOffice is a office productivity suite that is aimed squarely at Microsoft Office. It’s main customers are those who need to access to Office functionality but who don’t have the budget to but Microsoft’s applications. They’ve got a tough job, as Microsoft Office is the de-facto standard for office applications. This comes across clearly on their landing page. It’s longer than UberVu’s but they’ve done a good job of cutting the page clearly into three sections. The first is focused on the key conversion information and consists of a list of high-level capabilities (the top one being ‘Open all Microsoft Office formats’), testimonials from influential online review sites, and finally a clear instruction to ‘Download Now’. The second is a convincer. For those who aren’t convinced that this is the right replacement products, it presents more information on the individual applications. Once again, this is accompanied by a CTA box, reinforcing that this is a free and fully featured product (unlike some of their competitors who may offer limited trial versions). The third section is screenshots, for those who need to see what they are getting. This is, unsurprisingly, followed by another CTA box. 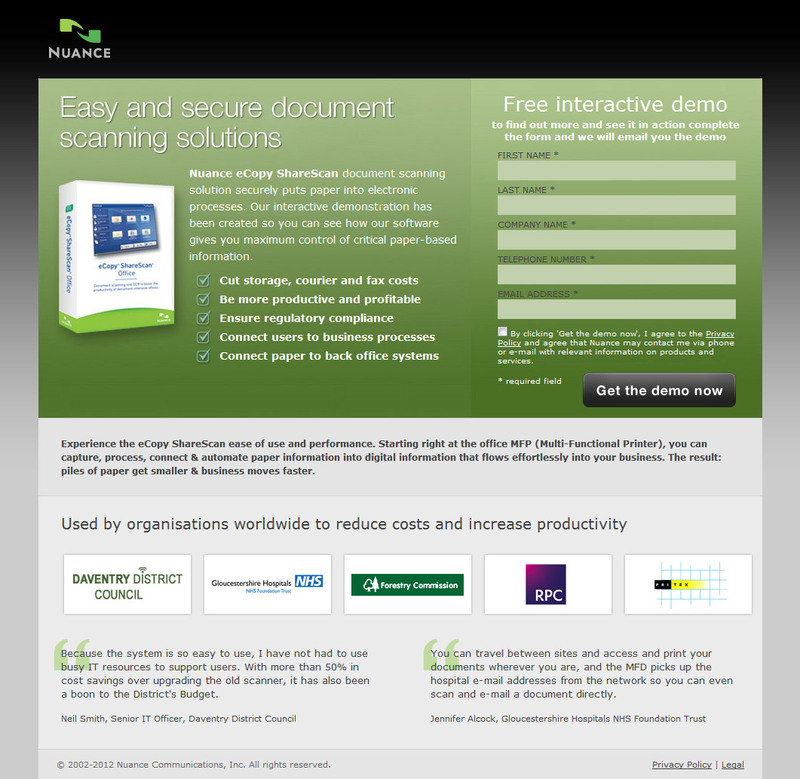 Open Office’s landing page is a good example of building a case for conversion in stages – with each stage providing more detail or a variation on the argument for downloading the product. The graphics and photo editing software market is another crowded place. 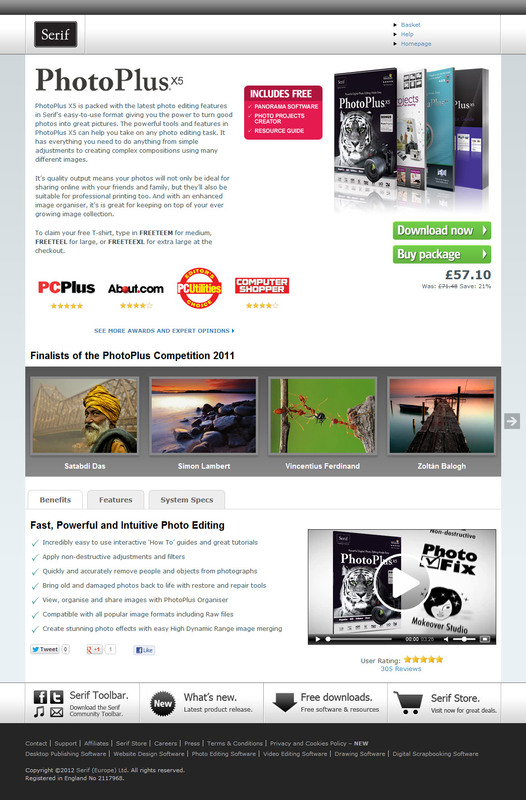 Unfortunately, Serif PhotoPlus doesn’t do itself any favours on its landing page. The elements are correct – we have some good ratings from trusted sources and a clear set of actions to take (supported by price information, which can often be hidden). There’s also a tabbed section where all the features, benefits and system requirements can be found. The issue lies with copy. Good copy; copy that is structured visually and written tightly, helps us to take in information quickly. This page contains too much copy in the ‘above the fold’ and it’s all in one block. The opening text is your opportunity to say what you are and why the user should stick around to find out more, and Serif misses the point here. This copy should be rewritten with informative headings and structural elements such as lists. 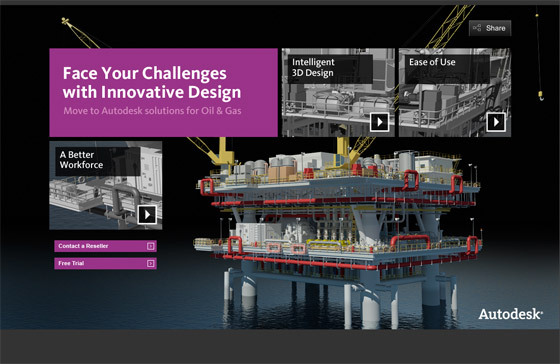 From one piece of graphics software to another. When your main competitor is Photoshop, it’s tough, but that’s where Gimp finds itself. 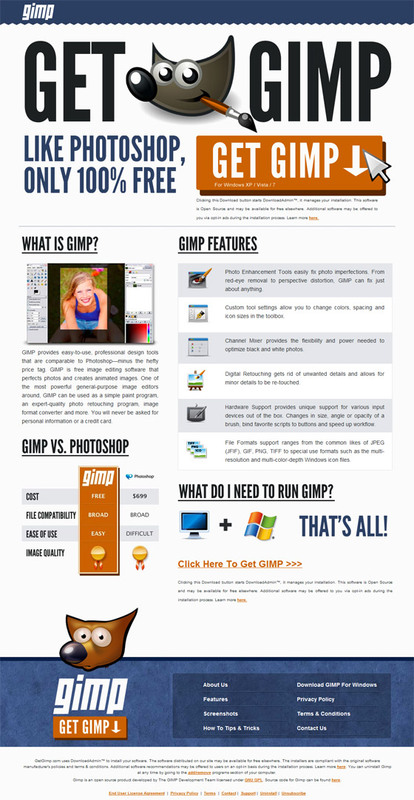 However, unlike Serif, Gimp does a great job of selling itself, and it’s all about the copy. The big font and catchy copy really makes it clear what they want you to do and makes it ridiculously easy for you to do it. Of course, they do provide additional information if you need more convincing, and it’s all presented clearly through headings and visuals, rounding off with another opportunity to download the software. This is a great example of how copy can help you convert. If UberVu was all about simplicity, then Podio is all about volume. 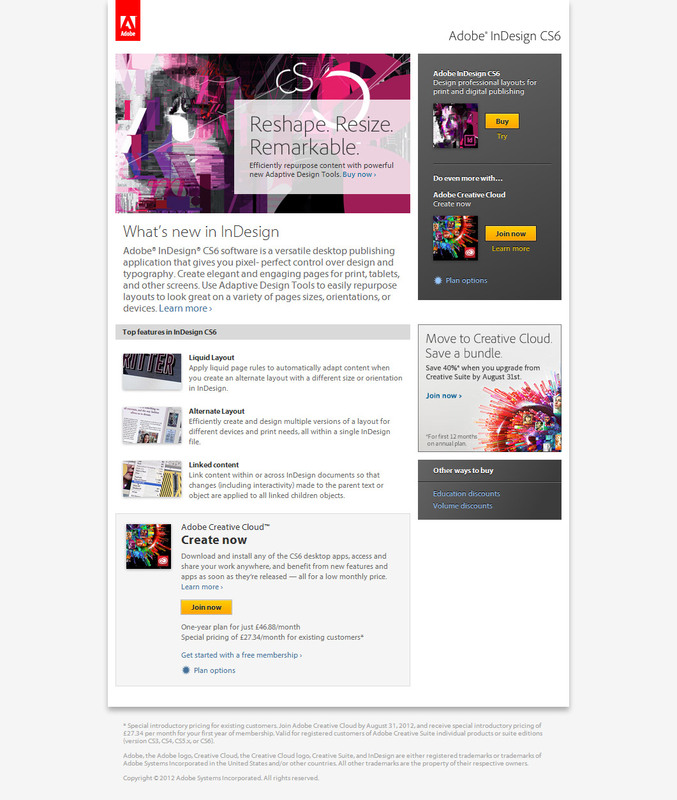 A good lead image shows compatibility with desktop and mobile, and gives you a clear idea of what the product offers. A picture is worth a thousand words (and a video even more). It’s also got a clear CTA and structured copy. But the testimonials section, it’s really long. Is this good? Testimonials can be incredibly persuasive in getting consumers to convert, especially when they are from big brands. Podio takes a different approach, removing the brands and making it personal. We’ve got numerous testimonials from individuals using the product, creating a tidal wave of positivity about it. And to bring it home, there’s a picture of each person next to their quote. It’s a change from the norm, but when you don’t have the big brands to call on, it can be very effective. Sometimes it’s the little things that can let a landing page down. 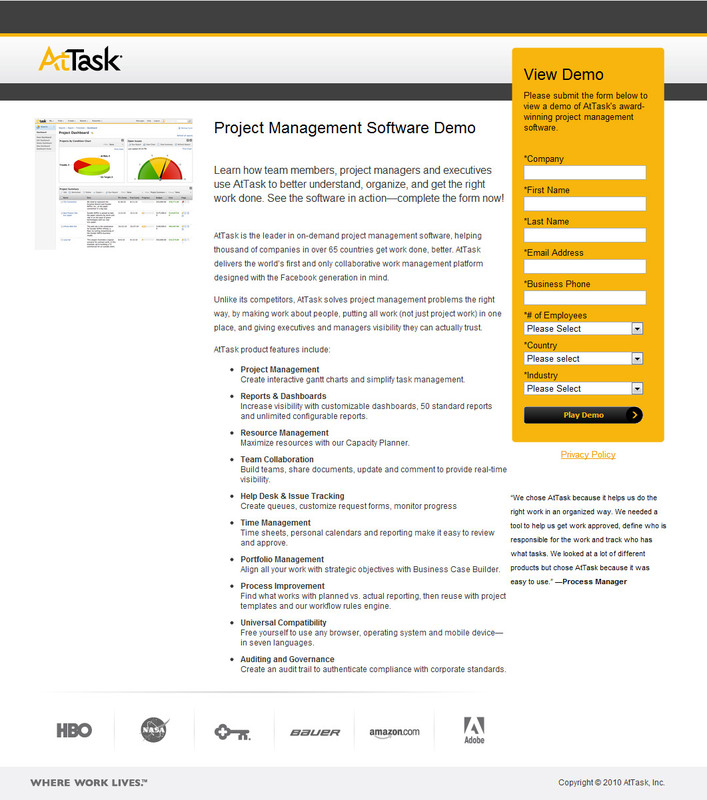 AtTask, a provider of project management software, looks like it has everything covered with this landing page, but looking more closely it doesn’t hang together. Why? 1. Poor Imagery – if your going to put a picture of the software on your page, at least make it readable, otherwise it can’t tell me anything. The only thing I can see are two very Excel-looking graphs. Underwhelming. 2. Lack of clarity – the heading on the CTA says ‘View Demo’, the button says ‘Play Demo’. What starts out looking like I’m going to get a personal call with someone taking me through the software, is actually only giving me access to a video. That’s not the worst thing in the world, but I’m being asked to give away a lot of information just to see a video. To drive conversions, always be crystal clear about what you are offering, and don’t over estimate its value. In this case, AtTask should be offering the video for free, possibly replacing the image, and using the CTA registration form to book a personal call. They should also minimize the amount of data the user is expected to enter – it’s a barrier to conversion. Another simple landing page from another social media management platform, this time it’s HootSuite. 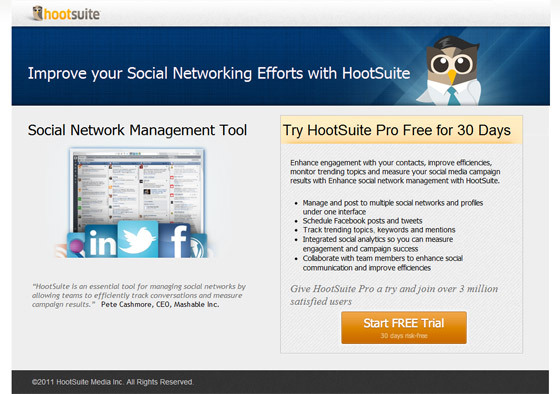 HootSuite Pro is the paid version of their free product, and offers business the ability to manage more platforms and work more effectively as a team. Unfortunately, the landing page doesn’t give us enough reasons to make the jump; in fact it comes up short in a number of areas. The CTA is good, it’s got a clear headline and the button text supports the ’30 day free trial’ messaging, but the supporting information is poor. The image is accurate but uninspiring, a video would provide much more clarity. The quote from Pete Cashmore, the influential and well-known editor of Mashable, is small and fades into the background thanks to the grey font. Finally, the bullets don’t give any indication of how the Pro product is better than the free version. The supporting information around your main CTA can be crucial in delivering conversions, make sure it delivers. Video, yes, it’s important, but not so important that you can do away with everything else. This landing page from Autodesk leaves me confused because it fails to give me any indication of why should watch the videos, and what I’m going to get out of them. The only context I have is the headline. I don’t even know what product this is about until I get to the videos (Autodesk Plant Design Suite, if you’re interested). This confusion is compounded by the poor CTA’s. Calling a reseller is fine – but about what? Free trial – of what exactly? This is a great example of how not to use video. Sorry guys. 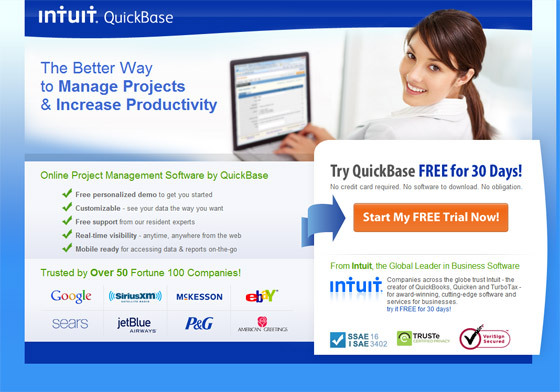 It’s fair to say that Intuits Quickbase landing page isn’t the greatest looking landing page in the world, from the stock photography to rather clunky layout, but it does its job. A good hierarchy and flow takes us through who, what, why and on to CTA. We’ve got good brands, clear features and a nice bright CTA button. Which just goes to show that landing pages don’t have to be the most beautiful pages in the world to be effective (although it does help). Nuance create document management solutions, helping business create electronic records from physical documents. In this case, they have testimonial quotes and customer brands, but they’re not strong. To counteract this they have moved them from the bottom of the page. Unfortunately this leaves the page trading on a straight one to one between your readiness to give up your data and the perceived value of an interactive demo. This isn’t a position you want to be in ideally, as there’s not enough information available upfront on which the user can make a value judgement. Nuance need to re-evaluate the value of the content to be given away, ideally giving more for free upfront, so that the leads that come through are of higher quality (rather than just people registering for something that they should already have). When optimizing conversions, always make sure that your users have enough information to hand to give them the confidence to contact you. Wembley is a fantastic stadium, but this isn’t a fantastic landing page. Landing pages should represent your brand and this simply doesn’t. Wembley trades on visceral experiences, such as the excitement of an England international where fans live out dreams. (And I should know – I saw England beat Croatia 5-1 at the new Wembley and qualify for the 2010 World Cup; it was a great night). 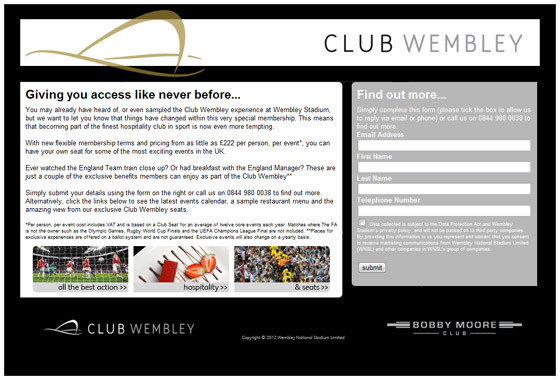 The landing page should remind us of these, it’s part of the reason why people would sign up to Club Wembley. On a practical note, the copy is unstructured, with key information hidden within the bland paragraphs, and the white text on a grey background a real no-no for readability. When creating a landing page, don’t forget the value of your brand and your product. Make sure it is commensurate with these values and does them justice. 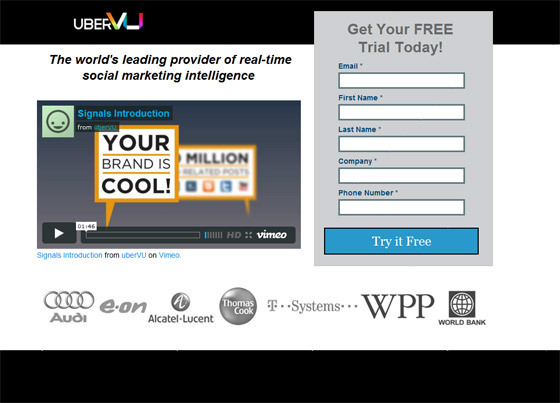 This is another landing page that fails to pass the Conversion test. Yes, the CTA is clear, but the rest of the page is a mess. Landing pages shouldn’t ideally exist within your main site, although a few will. They are an opportunity to talk directly to a captive audience, so everything on that page should focus on a single goal – the conversion. Sentiment Metrics have made the mistake of setting their page within the structure of the main site, and the result is a mess. We’ve got navigation elements and contact details, a search and a feedback tab; it’s all too much. This should have been a standalone page with customized information that is designed to take the user through the conversion journey. It might be a great product, but from this landing page I really can’t tell. UTest are a professional testing company. 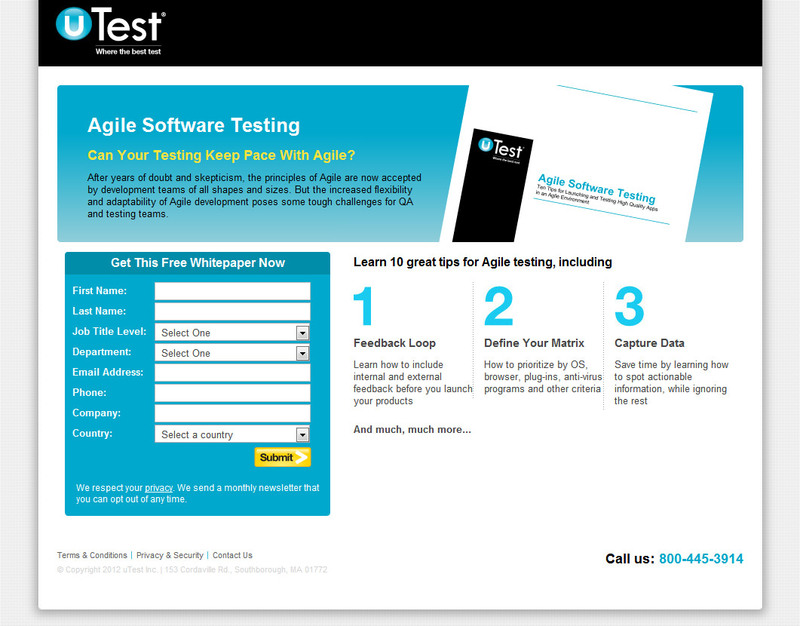 This landing page offers a whitepaper on Agile Software Testing, from which it gives us three tips as an extract: Feedback Loop, Define Your Matrix and Capture Data. All good, but business jargon. In this case it would be better to give out only one example, but in more depth, than three at a high-level. The art of the extract is to provide something compelling up-front that will drive the conversion. Make sure that the value of the give-away weighs up against the effort required to register. Otherwise this landing page has the basics covered. To finish off, I thought I would look at something very different: Match.com. 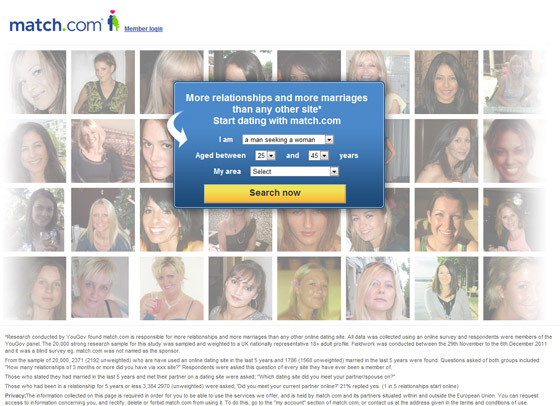 Match.com is an online dating site and relies on people converting for its operating revenue. The most valuable content it has is its members, so they do the most sensible and obvious thing to get you to convert – they let you take a look around. What’s great about this landing page is that they fundamentally understand the value of their product. Without asking for anything more than an area of the country, they will provide you with a teasing glimpse of what is available – who knows, if the user sees someone they like, they’ll be sold right there and then. It breaks most of the rules of standard landing pages, but just goes to show that if you want to drive conversions you have to start by understanding your product and your consumer. If you do that, you’ll be able to create engaging landing pages that really drive conversions and, ultimately, your business.